As loyal followers of this blog know, we have been publishing “Postcards from Israel” each Friday for the past few weeks, posts based on photos taken by Israelinurse – virtual trips to different destinations, highlighting the diverse and eclectic beauty of the country. 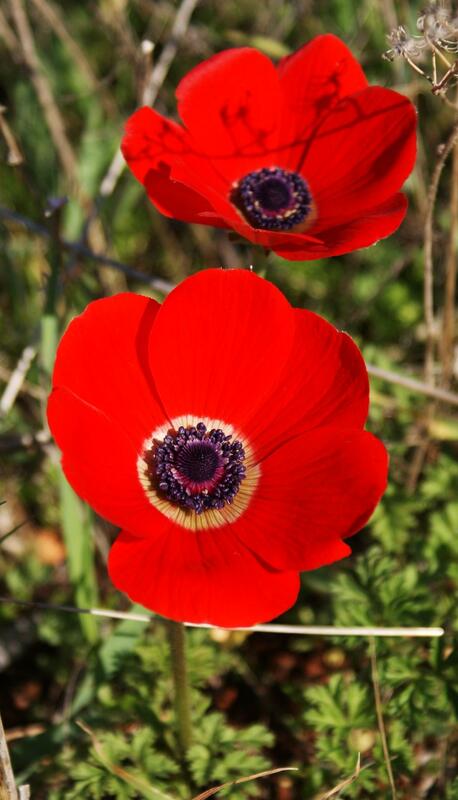 Here’s a photo from the most recent edition on Israeli wild flowers. Yet, despite the completely apolitical nature of such posts, one of our blog’s critics’ (who lurks beneath the line using the moniker “mostly harmless”) had this to say regarding the photos from the latest post. Yes, clearly mostly harmless was able to see through Israelinurse’s supremely cynical Zionist hasbara tactic of FLORAL-WASHING. What is the precise population of indigenous Palestinian flora (and their descendants)? Do they have a ‘right of return’? And, finally, how many flowers, given the forced seed dispersal following the 1948 War (aka, the Plantae Nakba), can legitimately claim refugee status? I imagine that such previously taboo discussions regarding Israeli cruelty will now give way to a new BDS protest movement. Well, mostly hamas ™ ® (©Thank God I’m an Infidel) was bound to recognise the flag symbolised by those blue Zionist flowers. Tongue-in-cheek acknowledged, Mr. Levick, but there are in fact, in all seriosity, a number of flowers whose scientific name contains the adjective Palaestinensis. An example is a species of veronica my flora treatise subtitles Veronica Palaestinensis. And even more poignantly, in Immanuel Kant, writing in the 18th century, of “the Palestinians among us” in reference to the Jews of the German-speaking Holy Roman Empire. Thus the older usage of “Palestinian” referred either to location (“Palestinian Veronica” equivalent to “South American Toad,” and similarly “Palestinian rabbis” to contrast with the ones who resided in Babylon at the time), or to the Jewish nation. So to answer a question related to the opening one, the precise population of indigenous Palestinians is about thirteen million, and they all have a right of return. The Society for the Preservation of Indigenous Cultures (whether human or not) further comments that, for the sake of diversity, there is need to protect this indigenous species from the encroachment of certain Arabica species which are in no danger whatsoever of soil deprivation, seeing as they have spread far beyond their soils of origin, the Arabian Peninsula. And, mind you, this is from a supposedly enlightened German. Maybe doc doo-doo will like Kant from now on. Quite notable that the modern anti-Zionists sink lower than the German Jew-haters of old. For the latter denied only the Jewish right to physical existence, while the former deny both that and the Jews’ spiritual identity (over 3000 years of Jewish national consciousness crushed underfoot in the narrative of “Zionism as European colonialism” and Sand’s feat of historical denialism). That´s a good point. However, many Europeans also loathed not only the Jewish but also the Christian heritage. It began with Voltaire, the father of enlightened anti-Semitism, who in attacked the Jews as a way to destroy the Church. This strategy was repeated many times from then on, including Kant, Eisenmenger, the German romantics and revolutionaries, including Fichte, Herder, Hegel and Marx. Their language was viotriolic and eliminationist from the beginning. We all know the climax of all that. Robotic palestinistas, such as mostly useless, sencrap and doc doo-doo are an endless source of comical material. I hope the ICJ will try Israel for the cruel flowercide going on. Thank you Adam for raising my awareness. Come to think of it now I’m sure that somewhere in the world a baby is crying because Palestinians can’t pick the black irises growing near Netanya. Apartheid flowers,I quite like them.And they are on occupied land no less,tell that guy that lurks on this site that it’s the palestinians that are occupying our GOD GIVEN ANCIENT ANCESTRAL LAND. Assuming that the flowers are from Israel proper – why not just answer “mostly harmless” and make them look silly? Will you also be posting a special article mocking ziontruth’s comment talking about “illegally Arab-occupied Jewish land”? Because that’s what it is, pretzelberg. That WWI you keep ignoring, remember? The Ottomans lost and greedy Arabs sold the land, including the (later Nazi) rotten old “Grand Mufti”. Passed a death sentence on others for selling land to Jews of course. Just like the Palestinian Authority now. Why do you think Mostly Hamas is owed anything? This is yet more thinking on the line that the Jews’ claim to the Land of Israel is something to be defended in some cobbled-up kangaroo court of “law.” It isn’t. The Jewish claim is the default one, and it’s the anti-Zionists who need to justify their ambition to rob the Jewish nation of its one and only state in the world before the court. You can get that on Electronic Intifada, Mound o’ Scheiss, DailyKKKos and the like. I can’t speak for the site owners, but I have reason to believe CiFWatch is pro-Israel. They may not agree with my opinions, but they seem to be reasonable people who wouldn’t kick a ball into their own goalpost. Actually, Mostly, it could be worse than you think. I didn’t get to ask the bee in the photo of the Rosemary, but it might be a colonialist. You see, when commercial bee-keeping first began here about a century ago, the keepers discovered that the indigenous Syrian bees were – as one of my bee-keeping friends describes it – ‘aggressive and low producers of honey’. So they imported Italian bees. You should probably boycott pasta now. Yet you seem to have no qualms about Ariadne’s “greedy Arabs” comment. Why not speak out re. the bigots that infest this website? People selling over-priced land aren’t greedy? And selling it while killing others for doing the same isn’t evil? Why do you need people to do and say everything you want, pretzelberg? You are another little dictator sojourning here and getting nowhere. Go away, you heartless bigot. Imagine the reaction here if someone poster “The Ottomans lost and greedy Jews bought/sold the land”. Pretzelberg, if anyone suggested the Arabs have a greedy nature, then you’d have point, it would indeed by an example of genetic determinism. But I don’t think anyone did. As Ariadne says later (“People selling over-priced land aren’t greedy?”), it’s the action that was greedy. Of course, anyone who does so is being greedy, but to conclude this is accusing an entire nation of being naturally greedy is a stretch. As an analogy and in all fairness, this is like I don’t accuse people of being Jew-haters for mentioning the folly of 78% of American Jews having voted for Obama, unless they start claiming it was part of Jewish nature, a collective Jewish action, a Jewish conspiracy or something of that kind. I think Arab anti-Zionism is nothing but greed, seeing as the Arab nation has over twenty states while the Jewish nation has only one, but that doesn’t mean I think all Arabs have a greedy nature. I disavow genetic determinism and relate to nations on the basis of their actions alone. If someone said “The Ottomans lost and greedy Jews bought/sold the land” you’d go banananas. Why the hypocrisy? Why not condemn the shameless bigotry of Ariadne? You refer to “genetic determinism” instead of racism. I wonder why? Precisely because the Marxists have emptied the term “racism” of its former meaning and made it an all-purpose smear-word lobbed at those they disagree with. Genetic determinism used to be an essential part of racism; now, as the otherwise literalist legal scholar Dubitante told me recently, racism doesn’t even have to be about biology. As I said, this is textbook Humpty Dumpty. As long as I haven’t suggested the Arabs are genetically inferior or naturally inclined to base conduct, your calling me a racist is nothing but slander. My case rests upon the classical definition of the term “Racism” that was extant prior to Marxist corruption; more than that I do not have to defend myself. Therefore, if you do not cease and desist from this slander, I too will accuse you of something you cannot prove you aren’t, and see how you like it. I disavow genetic determinism and relate to nations on the basis of their actions alone. As a knee-jerk reaction, probably so. But if they made it clear it was not a slight on the nature of the Jewish people, the discussion could move away from acrimony. Because you have convinced only yourself so far. Are you trying to compete with Dubitante for the title of “Most Obtuse Poster” on CiFWatch? You’re not a racist unless you attribute a certain nature, an aggregrate of immutable traits, to a genetically-related group. That’s the classical and true definition of “racism,” before the Marxists made it an omnibus smear-word that signifies nothing more than that the one smeared is on their opposition. If one does not make attributes to an entire ethnic collective, and if one’s accusations are about their actions rather than unchangeable characteristics (i.e. nurture, not nature), then the accuser is not using the term “Racist” as the dictionary and normal (non-Marxist) usage defines it. The accuser is then guilty of Humpty Dumpty’s trick of using words to mean just what he wants them to mean, and that is despicable. Why aren’t slanderers like Pretzelberg thrown off this website? ziontruth, I am delighted to be in such very good company. I wonder if pretzelberg has ever heard the word “effendi”, Or, in English the phrases, “absentee landlord” and “landless peasant”. But, above all I wonder if he has heard of World War One and the murders carried out of those Arabs who supported the law the League of Nations had enabled. Ariadne, I wouldn’t dignify Pretzelberg’s self-righteousness with a response if it weren’t for the misconception he repeated, a false idea regarding the term “racism” that I always wish to clear. For the benefit of anyone who’s ever grappled with the same. Other than that, your standard fare “Have you stopped beating your wife” type of accusation. I ignore those if I can, respond with a counter-accusation otherwise. Understood, ziontruth. Nobody relates to their purposeful “ignorance” for the reasonable ground it provides. I like moles, not trolls and their crumbs of molehills which they think hide the mountains of (largely deadly) omission seem like something other than fragments of dirt to them. Trollhills. I ignore those if I can, respond with a counter-accusation otherwise. a) Because you are desperately trying to defend bigotry. b) You actually have no counter-accusation against me. Have you stopped beating your wife, Pretzelberg? If so, when? If not, when are you going to? And don’t tell you don’t have a wife. Your desperate covering-up of your wife-beating won’t wash with me. Look just above to a counter-accusation against you that is on as solid a foundation as the one you level. Not at all – and you know it. It´s overdue indeed. Why these types don´t creat their own blog of losers? No fun, eh? You’re not a racist unless you attribute a certain nature, an aggregrate of immutable traits, to a genetically-related group. That would pretty much count out every call of anti-Semitism made on this website. Do you have any idea how utterly laughable you sound? Ariadne’s comment was out of line. Why go to such efforts to defend it? Bigots like you, SerJew and Ariadne do a disservice to this website. Why don´t YOU leave for good? YOU are the one having hysterical tantrums. Go find a therapist or go back to kindergardden. “blathers egoist” is an anagram of “heartless bigot”, pretzelberg. It’s quite descriptive of you. Hmm, let´s see: slanderous accusation plus sweeping generalization and insect-like characterization of people, not to mention blatant hypocrisy. And in just one line! Notice taken. Which mental midgets recommended the above? Yet another slander. You just can´t help it, can you? Using the term “mental midgets” in reference to anonymous individuals is hardly “slander”. So does “arab greed”, an expression you are so hysterical about. Why aren’t bigots like Ariadne and ziontruth thrown off this website? CIFW is supposed to be against prejudice, right? Or is it just one kind of prejudice? Maybe. Whatever the case, I don’t need to link anti-Zionism to Jew-hatred in order to declare anti-Zionism illegitimate. The various opponents of the Jewish State deserve condemnation for opposing Jewish self-determination alone, regardless of motive. At worst, awkwardly phrased like the comment I once made which the resident troll Sanity made a load of political hay out of. It’s a pity that you, rarely in the same class as Dubitante, Mostly Hamas, inSanity and the rest, see it fit to partake of their methods and talking points. Those labels get flung so readily today… such are our times. But I wonder: Why don’t I see you ever getting het up against all those who speak of “Zionism as European colonialism,” as Dubitante did in a recent thread? Or is racism (in the true sense of the word!) suddenly OK when it’s against white people? As far as I gather, CiFWatch is not a general anti-prejudice website but has a particular focus on a certain media outlet and its anti-Israel bias. And again, you have yet to convince people other than yourself that Ariadne and me are guilty of prejudice. As I mentioned above, it’s a Marxist tactic to wrest the term “racism” from its true meaning and use it as an omnibus smear-word. It’s little different from your touting of your degree at Shaman University, actually. *sigh* Look, when I think somebody (e.g. anti-Zionists in general) has no right to speak, I explicitly say so, instead of crying “Racist!” or “Shame on you!” or some other circumlocution. I do so all the time over at CiF. Or is racism (in the true sense of the word!) suddenly OK when it’s against white people? Now you sound like a CiF troll. Nice try – but you’re still obfuscating. If there were a comment on CiF about “greedy Jews” I’d challenge it and report it – also to this website. You are going out of your way to defend racist claptrap. Why? Name the non-Arabs who sold overpriced land to Jews. You’re not even ashamed of your “greedy Arabs” comment, are you? pretzels, What do you think $100 per barrel OPEC oil is? I don’t recall that. There was plenty of opportunity on, for example, the “Guardian’s false accusations” thread, coming from Dubitante. On the other hand, I remember you berating me for saying that the narrative of Zionism as European colonialism is a Goebbelsian Big Lie. You still haven’t convinced me, and besides, I know from reading about American politics how all too easy it is to use the R-word to deflect a valid argument. I wish to return to the main point. In my book, the ambition of over twenty Arab states to take away from the Jews their one and only single state can’t honestly be described by any other term than “greed.” Unless there is clear evidence that I have said that greed is a collective Arab trait, an inborn trait of every Arab, your use of the R-word constitutes deflection from the argument. That’s the issue: The ability to call imperialist greed against the Jewish State as it is without being thrown the R-word. I’m sure Ariadne is capable of defending herself. The reason for my insistent involvement here is nothing to do in essence with either Ariadne or me, but the burning question of the use and abuse of certain terms to terminate discussion. If you actually bother to read CiF treads, then you’re lying. This is beside the point. Why not criticise Ariadne’s “greedy Arabs” line? There are those who talk of “imperialist greed” re. Jews investing in proto-Israel. They are rightly condemned. “proto-Israel”(!) must be from the same stable as that “proto-masjid”, Solomon’s Temple. There are indeed wondrous things in the fantasiya. Like horses that don’t run. The heck I don’t read. You called Dubitante’s talking points “pathetic” once on that thread, which I agree 100%, but never an explicit calling him on his anti-white double racial standards the way you’re explicitly railing against Ariadne. Once again: Because I’m not convinced it’s anything worse than poor phrasing. Being guilty of that myself at least once (as I mentioned on this thread), I know other people are capable of the same. I have to say this aptly signifies the problem with your evaluation of this issue: You think there must be equity, but you don’t realize this is a war (be it only verbal). The vitriol here isn’t a bug, it’s a feature of the partisanship that both sides exhibit. Of course, the powers that be on any forum can moderate such partisanship and its effects out of their forums; however, that changes only the forum in question, not the reality. Man, yet another slanderous accusation. Unbelievable. Note taken. Where on earth do you get this “marxist” BS from? The entire debate above could have been avoided if Ariadne’s “greedy Arabs” comment had been removed and the poster banished. Bizarrely, it still stands. And the poster is still free to post their bigoted crap. Hmm, one more slander. Hard to keep track of them all. The worst phrase to me on this whole page is “proto-Israel”. There’s nothing but offence in that. The worst phrase to me on this whole page is “proto-Israel”. ….There’s nothing but offence in that. You pretend to take offence – while trashing the Arabs. If only pretzels would hold Arabs to the same standards he holds others. Clearly pretzels has racist views of Arabs as a group. What an utterly laughable comment. Thank God I’m An Infidel both posts racist comments and defends those of others. Oh, but anti-Arab comments don’t count as racism here, do they? Note to those engaging in personal insults and name calling against other commenters: your posts will be removed and you’re in danger of being placed in pre-mod.